The Object Management Group (OMG) likes to consider classes in a 4-level model, in which there is data, metadata (models), metametadata (metamodels), etc. This is way too confusing, so it is fortunate that W3C's standard only take up roughly 3-levels (much like Lisp). The Resource Description Framework (RDF) defines 3 metaclasses that do not fit nicely into OMG's architecture, so they span several modeling levels. This can be seen in the image below, where containment indicates a rdf:subClassOf relationship, and the arrows indicate a rdf:type relationship. Although there was no indication in the standards that owl:Class is an instance of rdfs:Class, it is a logical consequence, because owl:Class is a subclass of rdfs:Class, and rdfs:Class is an instance of itself. However, the same could be said of rdfs:Datatype, for which there is an explicit mention that rdfs:Datatype is both a subclass and an instance of rdfs:Class. There was also an issue about this, which decided the reason for owl:Class was to be distinct from rdfs:Datatype, not because of some cyclic dependancy stuff. So to keep the model simple, and to minimize cycles, we can ignore the fact that rdfs:Datatype is an instance of rdfs:Class, because this is implied by the fact that rdfs:Class is an instance of itself. Notably, we have ignored the rdf:Property class, which is part of the model level, not the metamodel level. 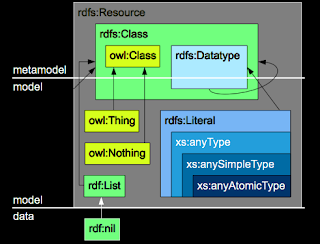 So the image above is an accurate depiction of the Web metamodel, which consists of only four metaclasses: rdfs:Resource, rdfs:Datatype, rdfs:Class, and owl:Class. Aside from owl:DataRange, this is a fairly complete picture of the Web metamodel. For beginners, the distinctions between these five metaclasses are essential before more indepth discussions take place. If one has any confusion about these distinctions, then nothing else about OWL will make any sense.